MARVEL’S CAPTAIN AMERICA: CIVIL WAR. (DVD Artwork). ©Walt Disney Studios. 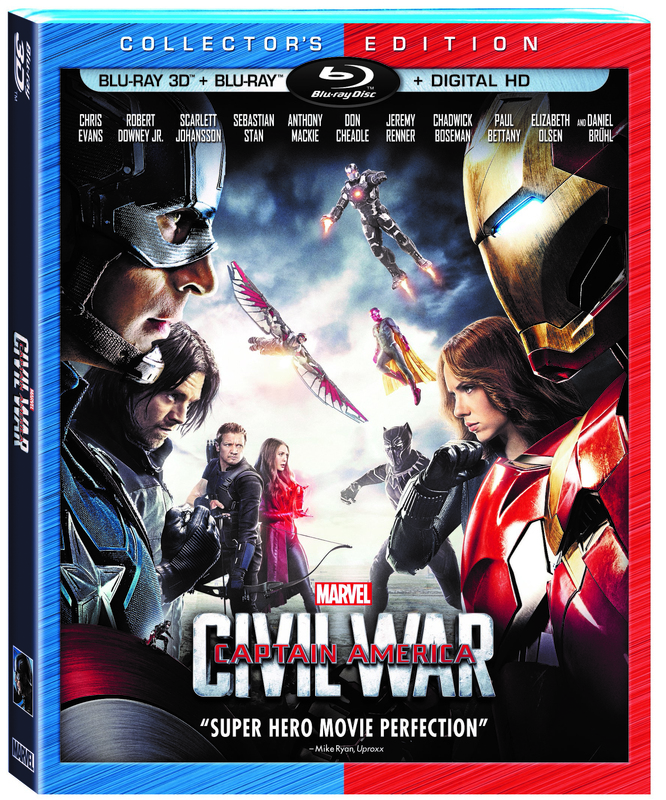 A rare Hollywood blockbuster that actually lived up to its hype, Marvel’s “Captain America: Civil War” is now available to bring home on Blu-ray from Walt Disney Studios Home Entertainment (MSRP: $32.99). Following an incident in Lagos that resulted in a number of innocent lives lost at the hands of the Avengers, the government decides it’s time to pass a law that limits the superheroes’ actions. Dubbed the Sokovia Accords, the bill is supposed to establish an international governing body to oversee and control the Avengers. While Iron Man/Tony Stark (Robert Downey Jr.) supports the idea, especially after meeting the mother of one of the Avengers’ many innocent victims and learning more about the brilliant young man, Captain America/Steve Rogers (Chris Evans) is immediately against it and feels that the Avengers should have the freedom to continue to act on their own. The rest of the Avengers (minus Thor and The Hulk, who are sadly missing from the movie) quickly take sides on the issue, a matter that only becomes worse when Captain America breaks away from the rest of the group to protect his old friend, the Winter Soldier/Bucky Barnes (Sebastian Stan). Barnes is believed to be behind the attack that killed King T’Chaka (John Kani) during the Sokovia Accords ratification, though Barnes claims he was framed. With half of the Avengers on his side, Captain America goes rogue to prove Bucky’s innocence—although the truth that’s uncovered might just be the flashpoint that tears the Avengers apart once and for all. Whereas the battle between Batman and Superman during this year’s “Batman v Superman: Dawn of Justice” was superficial at best, the issue that has the Avengers divided truly packs an emotional punch. Not only are some of the Avengers’ voiceless victims given names and backstories, but also the ultimate reveal at the end of the film will leave audiences sympathizing with both sides of the Avengers’ camp. As such, even the strongest loyalties between Team Iron Man and Team Cap are tested, both strengthened and weakened throughout the film’s brisk 147-minute run time. New Marvel superheroes and old favorites also take a stand with the Avengers in “Civil War,” including Paul Rudd’s Ant-Man. While the new Spider-Man, Tom Holland, gets a couple of good lines in, he sort of seems just thrown into the mix to re-introduce him to the Marvel Cinematic Universe rather than serving an important purpose in the storyline. It’s Chadwick Boseman (“42”) as King T’Chaka’s vengeful son T’Challa who makes the biggest impact in the film as Black Panther and the talented actor is a welcome addition to the Avengers’ already impressive cast. Despite the many star-studded superheroes, though, fans can’t help but feel that something—or more specifically, someone—is missing. Even though “Civil War” isn’t technically an “Avengers” movie, it would have been nice to see Thor and/or The Hulk make a cameo appearance during the film. Granted, the last time audiences saw The Hulk he wanted nothing to do with the Avengers, yet fans can’t help but hope throughout the movie that the beloved absent superheroes will return. The film’s weakest point is probably the villain behind the scenes pulling the strings: a Sokovian terrorist named Zemo (Daniel Brühl) who is obsessed with destroying the Avengers from within. While he gets a nice scene with T’Challa toward the end of the movie, for the most part his character is fairly forgettable, even if his actions are crucial to the storyline. Of course, given the context of the film, the Avengers should always be front and center, so it’s appropriate in a way for Zemo to be so easily forgotten. That way, audiences can focus more on what he does rather than who he is. The story wouldn’t work nearly as well if Zemo stole every scene he was in like Tom Hiddleston does whenever he’s on-screen in a Marvel movie as Loki. 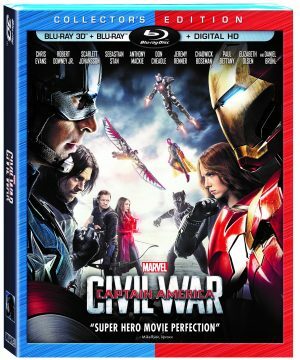 Typical of most Disney home video releases, the Blu-ray release of “Captain America: Civil War” comes loaded with bonus features, including five featurettes, deleted and extended scenes, a gag reel and an audio commentary track. The best extra of the bunch is the two-part “United We Stand, Divided We Fall—The Making of ‘Captain America: Civil War,’” which takes an emotional look at the making of the film, moreso than most other making-of featurettes. Part one runs approximately 22 minutes and covers everything from bringing the comic book story from page to screen to filming the fight scene at Bucky’s apartment and the car chase that followed. 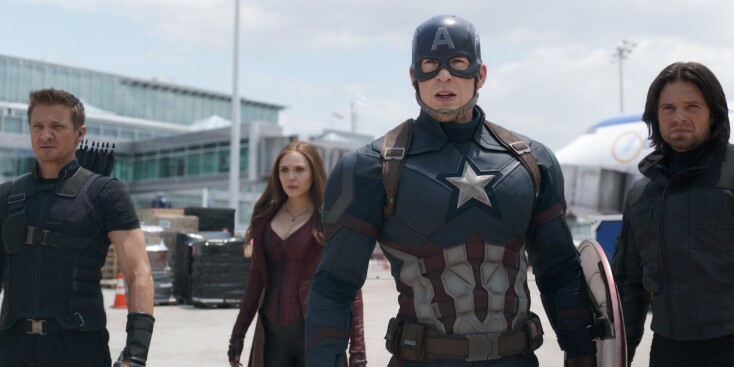 It also tackles the development of Scarlet Witch (Elizabeth Olsen), the scene in Lagos, how War Machine’s (Don Cheadle) costume has changed (Cheadle notes he can now touch his nose while in the more flexible suit), how Paul Rudd turned into a 10-year-old when he saw Chris Evans as Captain America on set for the first time and how Black Widow thinks more like Nick Fury (Samuel L. Jackson) in this film owing to Jackson’s character’s absence. Part two, meanwhile, runs just over 23 minutes in length and focuses on Vision (Paul Bettany), Black Panther, Spider-Man and Zemo. Viewers will see footage of Boseman training for his part in the film as well as hear Bettany joke about how he sometimes has to remind himself of how lucky he is to play Vision while getting into makeup and costume. Other highlights include hearing how select crewmembers teared up while filming the battle scene and how the first thought Boseman had after being cast as Black Panther was how kids were going to be dressing up like him for Halloween. There are also two short featurettes, running approximately four minutes each, on Captain America and Iron Man’s “Road to ‘Civil War,’” that highlight the evolution of the characters with clips from preceding Marvel films. It’s interesting to see just how much their characters have changed over the course of the films, not to mention how much the two actors seem to genuinely like each other in real life. Wrapping up the Featurettes section of the Blu-ray release is a quick look at Marvel’s upcoming “Doctor Strange.” The four-minute extra not only features clips and concept art from the November release, but also interview snippets with some of its stars, including Tilda Swinton as The Ancient One and Benedict Cumberbatch as Dr. Stephen Strange. Four deleted and extended scenes are included on the disc as well: “Extended Peggy’s Funeral,” “Zemo Meets Doctor Broussard,” “‘You Are Not Used to the Truth’” and “‘Gotta Get Me One of Those.’” None of the scenes really add much to the film so it’s understandable why they didn’t make the final cut. Of the four, “‘You Are Not Used to the Truth,’” which features Boseman and Johansson’s characters talking, is probably the most interesting, with “‘Gotta Get Me One of Those,’” where Bucky comments on how he wants Captain America’s signature shield, a close second if for no other reason than the fact the scene is unfinished. That means viewers get to watch the action-packed sequence without any visual effects added in. The three-minute gag reel is surprisingly sparse on laughs, focusing more on the cast making funny faces and dropping the F-bomb (bleeped out, of course) than any real comical mishaps on set. While viewers might chuckle when Stan Lee screws up his line or Sebastian Stan accidentally breaks one of the props, given how close the cast is, it seems like there were plenty of laughs had to keep things light on set that sadly weren’t showcased here. Rounding out the extras is a commentary track with co-directors Anthony and Joe Russo and screenwriters Christopher Markus and Stephen McFeely, who all worked together on “Captain America: The Winter Soldier” as well. Although there are times the four remain silent, for the most part the commentary track is an informative look at the making of the film, discussing how this Marvel movie was “the most dependent on everything that came before it” because it dealt with the ramifications of plot lines picked up from the previous films. Viewers will learn how certain scenes were inspired by other movies (“Jaws,” “Star Wars: Episode V—The Empire Strikes Back”) and even music videos (DJ Snake and Lil Jon’s “Turn Down for What”); how it took Paul Bettany 2-½ hours to get into makeup; how the filmmakers would go over to Robert Downey Jr.’s house for lunch each week to talk the actor through his scenes; just how hot it was on set during the climactic battle sequence; and more. The filmmakers even debate whether or not Vision goes shopping for his clothes or just makes them himself and whether or not the Marvel Cinematic Universe is a giant TV show. For those who saw “Captain America: Civil War” in 3-D when it was in theaters, there’s also a Collector’s Edition available (MSRP: $39.99) that includes a 3D Blu-ray copy of the film as well as a regular 2-D Blu-ray disc and a code to download the film in Digital HD. The 3-D transfer is fairly impressive, adding a lot of depth to certain scenes although the colors aren’t always as rich as with the 2-D transfer. The battle scene, though, is worth the investment alone for those who have 3-D capabilities at home, putting viewers right in the midst of all the action. Sadly, the comical short Marvel released online to promote “Civil War’s” HD release that explained what Thor was up to during the film isn’t included on either Blu-ray release. Ultimately, the “Captain America” franchise only continues to get stronger as it goes along, as proven by this valiant third effort. While “Captain America: Civil War” may leave audiences divided on which Avenger faction they side with, fans likely won’t be split on their reaction to the film. Chances are they’re going to love it.